1. There has been a 3.59% increase in the number of properties since the last SDR release, growing from 2.6 million to 2.7 million properties. There has also been a 1.9% fall in average weekly rent, decreasing from £96.73 to £94.88. 2. The social housing provider with the highest number of properties is Clarion Housing Group with approx. 108k properties in total, located in each region of the country. The next largest provider is London & Quadrant Trust with approx. 74k properties. 3. The region with the highest number of social housing properties is the North West, with 60k belonging to Liverpool and 52k to Manchester. 4. The North East has substantially more properties than it did last year. In the 2016-17 SDR, the North East region had the fewest number of properties in the country with just 160k. Now the North East has more properties than East Midlands, with approx. 185k properties, a 15.89% increase. On the flip side, Yorkshire and the Humber region has experienced the smallest growth in social housing stock compared with the other regions, since the previous release, with 1k new properties (an increase of just 0.6%). 5. The provider that has grown the most since the last release is Optivo, gaining over 39k properties (a 281,578.6% increase). 6. There has been a large increase in social housing provided by for-profit organisations (52.17%), particularly in the South East region. 7. Interestingly, each region of England has seen a fall in average weekly rent, with the biggest fall occurring in the West Midlands (4.49% decrease). 8. 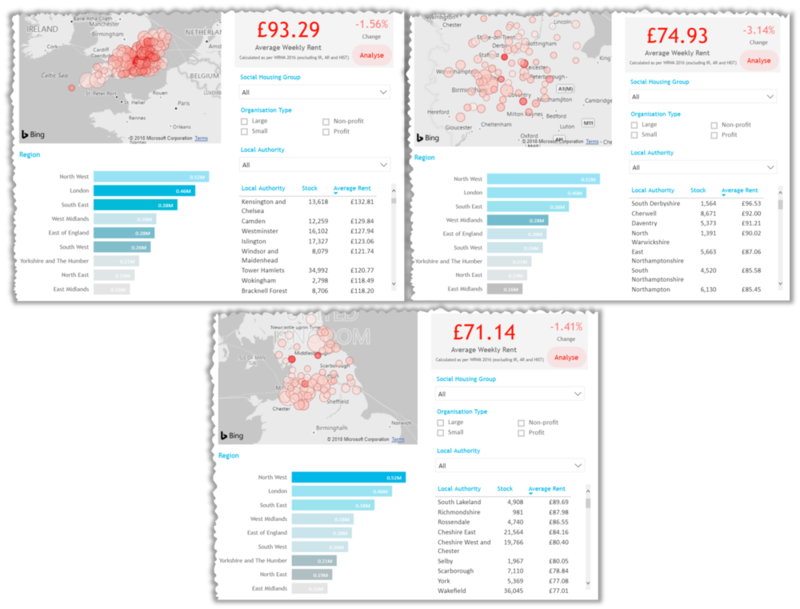 There is a clear North vs. South divide in average weekly rent, with the South having a £18.36 higher weekly rent than the Midlands, and a £22.15 higher weekly rent than the North. To view the full dashboard, click here.